Some of you may remember that last spring we had several laptops stolen from our classroom. It was very discouraging to me as I had been collecting these ten year old laptops off from eBay and loading them with math software to use in our math program. After they were stolen, I just did not have the motivation to start over again. However, recently I have started to collect and fix some more computers. 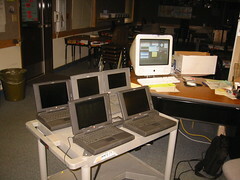 Most of them are Powerbook 5300s which was the last model before CD drives were installed. Therefore, they are not that valuable to the main market, but fit our needs quite well. There is plenty of educational software that will work on them, and with an external floppy connected to my eMac, I can print any of their word processing. So if you have any or know of any old Powerbooks, and you want to donate to a good community cause, just let me know.